Are you looking for a mattress that won’t break the bank? Do you prefer a firm mattress? Overall, we recommend IKEA’s Haugesund mattress if you are looking for a guest bed or an inexpensive product for your children. IKEA is a well-known name in the home furnishings industry. Not only does the company offer numerous items for all rooms in the house, it also features an extensive mattress line. While IKEA is recognised for offering quality items at low costs, how do their mattresses compare — particularly the Haugesund mattress, one of the company’s top spring mattresses? The Haugesund mattress is created using Polyurethane foam and pocket springs. It is ideal for lightweight and smaller sleepers — like children — who don’t require much support. The mattress is only 10-inches thick and the steel coils are not designed to withstand heavier individuals. Unfortunately, many users of this mattress complain that over time, this mattress begins to wear down and will quickly lose its support. However, if this mattress is placed in a guest bedroom or in a child’s bedroom, it will last much longer and is worth considering. This IKEA mattress is available in several sizes and you can choose between firm and medium-firm options. Although, in regard to the medium-firm mattress, several customers state it is a very firm mattress. Many users of this mattress, along with several additional IKEA mattresses, need a mattress topper to soften the bed, particularly if you are a side sleeper who requires a more plush bed. You like a firm mattress: Stomach sleepers will benefit most from the firm design of this mattress. However, many users say it is almost too firm and use a mattress topper to soften it. You want to keep your costs low: The Haugesund is considerably less expensive than many of its competitors. You can save thousands of dollars by choosing this mattress in your home. A long warranty is important to you: A 25-year warranty is included with this mattress, which is one of the longest warranties in the industry. The average warranty on a mattress is up to 10 years. You want options: Not only can you choose between a firm and medium-firm mattress, but this product is available in twin, full, queen and king sizes. You won’t sleep in the bed often: If you do not use this mattress extensively, it should last for several years and you shouldn’t experience any sagging. Users who placed this bed in a guest room or used it for children had high overall satisfaction ratings for this product. Firmness: Firm mattresses are ideal for stomach sleepers who need to stay afloat on the mattress. Back sleepers need a medium-firm mattress – a firm mattress, yet with plenty of cushion. Side sleepers should consider a softer mattress that they can sink into and that will more easily adjust and accommodate the body’s curves. Construction: Mattresses are made from a variety of materials. If interested in an innerspring mattress, look for products with a high coil count. Typically, the more steel coils the product features, the greater support and weight distribution the mattress provides. Durability: Look for mattresses made with high-quality materials. Low-quality items and poor construction with shorten the longevity of the bed. Furthermore, before making any purchases, read through customer reports to determine how well the mattress held up for other customers after extensive use. The best mattresses should last 8 years or longer. Thickness: The thicker the mattress, the more support it offers heavier individuals. Mattresses less than 10-inches thick will provide enough support for lightweight and average sleepers, as well as children. Price: The low price of a mattress can be a large draw for many customers, but you need to determine if the product offers any value. Mattresses can range in price from $150 to more than $5,000. Many inexpensive mattresses have poor durability and you will find yourself purchasing a new mattress in a few years. Warranty: The best warranties will cover a mattress for a minimum of 10 years. A longer warranty shows the company stands by its products. However, read through the policy as even the longest warranties may contain many exclusions which void the warranty. Q: How do I care for the mattress? Do not wash, bleach or iron the mattress. Wipe it clean with a damp cloth and vacuum it clean. Q: Does it come with a removable mattress cover? This mattress does not come with any type of bed linen. Q: Should I regularly flip the mattress? No, the mattress is designed to be used on one side only. The Haugesund mattress is a great choice if you prefer a firm bed and are looking to keep your costs low. This mattress is hundreds of dollars cheaper than similar products, but it isn’t as durable and supportive as its competition. 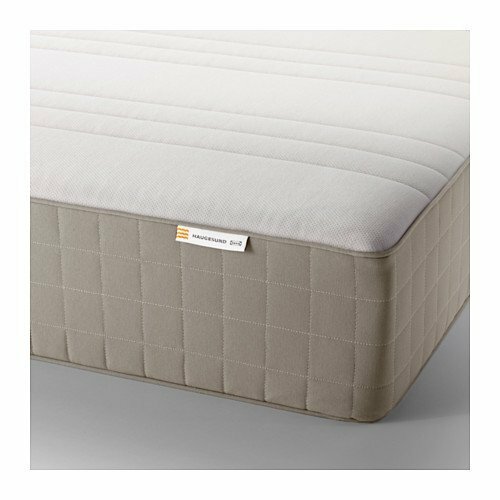 The coil’s strength and 10-inch design of this mattress makes it ideal for lightweight or smaller individuals. Heavier individuals should stay away as this mattress does not provide the support they need for their large bodies. Fortunately, this IKEA mattress offers a competitive warranty and exchange policy, which are large benefits to this product. Overall, we recommend IKEA’s Haugesund mattress if you arelooking for a guest bed or an inexpensive product for your children.